Jeff Probst help me, that was a damn entertaining episode of Survivor. During the first two episodes, it was difficult to get a firm impression of this cast. The narrative of whether they were going to be challenge-focused or schemers, whiners or pushovers, intelligent or idiots all got a bit lost in the downward spiral of awful that was the female tribe. Tonight, more of both tribes’ colors came out, and I’m happy to report they are actually somehow all of the aforementioned things combined. What do all of those things combined make them most of all, though? Awful. They are all awful. Seriously, I can’t remember being so annoyed at so many contestants so soon in a season. The surprising thing is that I’m not angry about it. Tonight was full of absolutely idiotic behavior, but it managed to coalesce into something that was almost delightful in its explicitly awful portrayal of human behavior. Sure, having likeable people in a reality show is important, but for now? I’m kind of having fun reveling in everyone’s miserable personalities for a little while. All of this unsavory behavior starts as a continuation of the women’s woes last week, exacerbated tonight by a string of brutal storms their shelter is inadequate to contain. We’ve learned in the past that one of the best producing partners Survivor has ever had is Mother Nature and watching the ladies freeze and shiver until they literally break down in tears definitely proves this point. Their misery causes them to seek warmth and solace over on the men’s side of camp, which starts out as a few men offering their help out of pity but quickly turns into resentment on the part of most of the men as they feel taken advantage of. The women immediately get defensive when pressed for a return favor (and their sense of entitlement—like they deserve the men’s fire—is fairly galling), which in turns stokes the men’s anger, leading to an uncomfortable but compelling sequence. It’s an interesting situation that could only really happen because of the twist of having both tribes on one beach. How much should the men be expected to just give the women, seeing as they are in competition? How much should the women expect to give in return for their help? How much of what the tribes can do for each other is just simple human kindness, and how much is playing the game? There are no clear answers here, but what is clear is how horribly both tribes deal with each other during the whole ordeal. Sooner or later, these people are going to have to work with each other instead of against each other. Making such easy enemies now seems foolish. One thing happens to break up this exercise in awful human behavior: The women win both the reward and immunity challenges. I’m sure Jeff will chalk it up to his “buck up, little camper” speech at last week’s Tribal, but it’s more likely that these challenges were simply better suited to this particular group of women’s strengths. Still, they absolutely smoked the men in the memory reward challenge (totally proving definitively that women are better than men at remembering stuff!) and managed to overcome a serious time deficit at the end of the immunity challenge to win on the final puzzle. Not only do these triumphs save us from another patronizing Probst speech at Tribal, they also allow us to spend some time with Manono for a change, where we learn they are just as dysfunctional—if not more—than Salani. Most of this dysfunction stems from Colton, who is annoying on levels reality television hadn’t even discovered prior to his existence. The best thing about him was his wherewithal to form an alliance with Jonas, Troyzan, Leif, and Tarzan last week, giving them the opportunity to flip the power switch on the Bro-liance. If Colton is unbearably whiny, Bro-liance leader Matt is unbearably arrogant, believing he and his (minority) alliance are running the show without taking the time to even take the rest of the tribe’s temperature to see if this is the case. 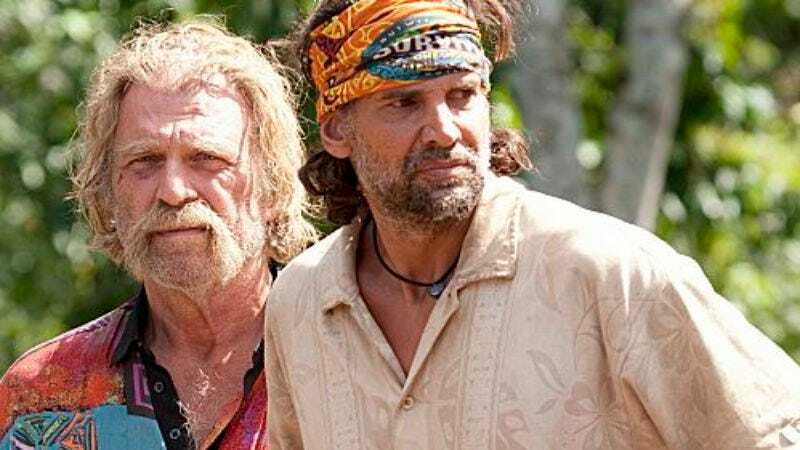 After Colton’s alliance starts mentioning potentially cutting the other alliance off at the head by eliminating Matt, Matt quickly scrambles in an attempt to lure Troyzan over to his side. The problem with Matt is he reeks of insincerity and desperation and makes a lot of nonsensical analogies about fowl. Oh, and he calls the people not in his alliance “the Average Joes.” To one of their faces. Basically, Matt is a doomed douche, a casualty of his own egotism. Yes, Matt’s ouster made me happy because he was an unbearable presence, but it’s also a really interesting turn for the game to take. The first two episodes made it appear the Bro-liance dominance was inevitable, but Colton flipping the narrative switch so soon makes for a much more compelling road to come. The best part? This all started because of something the producers did. By making the idols accessible to one tribe only, forcing Sabrina to hand hers over to one of the men, the dynamics were tweaked just enough to allow this to happen. Unlike Redemption Island, the twist this season is paying off dividends often and early. So sure, I kind of hate all of these people right now. At least I hate them in a way that means can’t wait to see what stupid things they’ll do next. The puzzle used in the immunity challenge was pretty great: different, difficult, and visually interesting. Tarzan is going to prove mentally incapable of playing this game, isn’t he? The idea of secrets and subterfuge seems like a concept just beyond his grasp. He told Jeff all of the things. Jeff: “In addition, clearly, you are playing for momentum.” Does that come in all sizes, Jeff? And can we return it if we aren’t satisfied? Colton: “I’m a Republican; I’m not a Democrat. I do not believe in handouts.” Says the man who was handed an immunity idol by Sabrina.